This blend is for joint discomfort, achy limbs, and muscle aches and discomfort that often result from normal training and everyday activities. For a horse with spooky behavior, restlessness, or irritability, the herbs in Herbsmith Impulsion with Composure also have a calming effect. 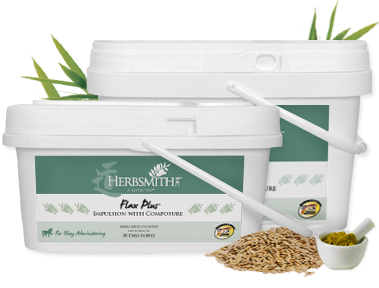 This blend is used to support joint and limb health in the horse that is too excitable and easily over-stimulated. The resolution of the discomfort is often accompanied by a calmer and easier to handle temperament. Still Have Questions About Flax Plus Impulsion with Composure?